Beginning guitarists have to deal with potential stumbling blocks, be it a pro or a complete rookie. You need to learn the chords, properly strum the strings, and you have to encounter the frets on which you maneuver your fingers to make the chord you want. In most cases, beginning guitarists are often seen intensely in front of their chord chart, then looking at the neck of their guitars, followed by his fretting hand, next in his strumming hand and back to the chord chart and seemingly to an endless cycle again. Which makes them more of a bobblehead than a cool musician. And everything of this often happens after the buying the selected guitar! And it seems that no matter how skilled you are, the wrong choice of the guitar type would hinder your progress and would ruin your learning process and most importantly, your joy. This is true on whatever kind of guitar it may be such as acoustic or electric but in this article, we are going to narrow our focus on the particular aspect of the acoustic guitar in its body shape. More especially that knowing about your acoustic guitar shapes is essential. The ongoing popularity of dreadnought guitars can be traced back in the mid 20th century when folk musicians, including the bluest guitarists, were using this type of guitar to make a name in the music industry. 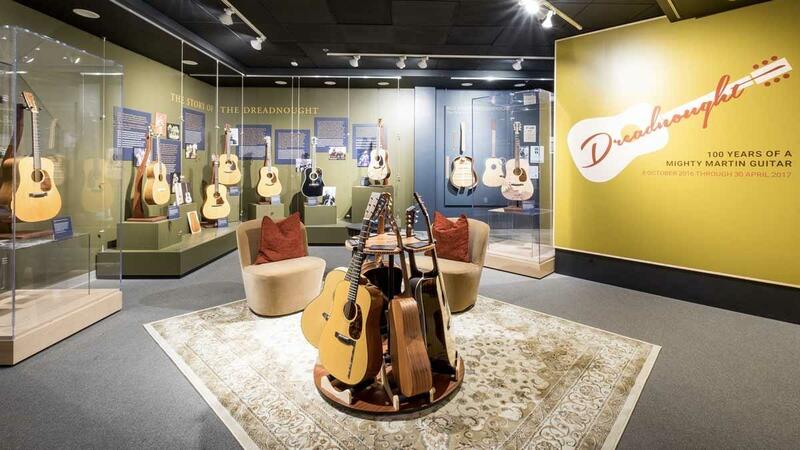 By now, dreadnought guitars are considered as the standard guitar for bluegrass music wherein most of the bluegrass musicians use dreadnought guitars to produce a signature sound in that certain genre. Dreadnought guitar is also one of the most typical shapes of a body in acoustic guitars. This shape of the acoustic guitar is crafted differently along its specific sound and tone. It supports the vocal accompaniment very well. The dreadnought guitar is slightly more rounded having a minor difference than the traditional acoustic guitar regarding its roundness, bringing forth beautifully full, punchy, and articulate tones. It’s also very important to note that the most distinctive marks of this type of guitar are that it has square bottom and shoulders. On top of that, its neck is usually attached to the body at the fourteenth fret. Dreadnought guitars are also best played for strumming than to play it in finger-style due to its deeper depth of volume which makes it sometimes overwhelming bass end sound. In brief, dreadnought guitars feature a bolder, often louder, and even richer than any other guitars out there. The dreadnought body is usually a bit deeper which is very important because this added depth will make more volume and often provide sustain and resonance than any other smaller bodied acoustic guitars. Another feature of dreadnought guitars which you might want to consider is that is interchangeable. This is very important if are used to playing guitars because you can just transition in playing dreadnought guitars facing the very little problem. The added benefit is that if someone borrows your guitar and play it, the person will have no trouble in playing it, neither because the traditional pick guard will take care of it. On top that, because dreadnoughts guitar is very popular in the market, chances are there is a wide range of selection from various guitars manufacturers with a reasonable price equivalent. The added depth of volume of dreadnought guitar is due to its relatively bulky box container which can make it hard for a beginner to hold the body of the guitar comfortably. If you are a still a rookie, this is going to be a problem because you might have trouble in handling it especially if you are going to the fretboard and try to tip it. Another cons of dreadnought guitars is that you need to use steel strings. This should not be a problem, though, if you prefer steel strings than nylon strings. But if you like playing your guitar with nylon strings, then dreadnought guitar is not for you. This is due to the long scale length of dreadnought guitars. If you are still willing to move along with in it, then you should be able to endure calloused fingers while learning to make chord shifts at the same time. Another thing about dreadnought guitars is that it has a relatively narrow neck which may not be ideal for people with fat fingers. If ever you have shorter arms, a dreadnought style guitar can be quite uncomfortable for you due to its large size. Because of this, chances are you might get your arms dig into the body of the guitar when you reach around for it to strum. This will make it harder for you to play the guitar because it will be difficult to find a good position. If you’re already in the music store, it is inevitable that almost all of the guitars in stock are going to be dreadnoughts. You might think it’s better off to settle for one. But, it’s also important to see if you are comfortable holding the guitar so that it would be easy for you to maneuver it later. Regardless of what type of guitar it may be, it is important to ask an opinion of your friend or a salesperson if you are holding it correctly. After all, if you are going to invest in owning a dreadnought guitar, you have to make sure that you are comfortable playing it. If you’re still having problems with dreadnought guitars, you might want to ask the salesperson if it’s okay to check out a classical guitar, even if you are not planning to buy one. The thing here is that at least you were able to check the fit of the body of the guitar may it be classical or dreadnought guitars and find out the size and shape of your reference.